In Tamil Nadu among the many religious festivals observed in the name of “God Siva” (God - as Siva), is the "Kaarththikai Vilakkeedu" also known as "Thirukkaarththikai" falling within the period from November 16th to December 15th the eighth Tamil Month of the year known as Kaarththikai Thingal (Thingal = Maatham). (This year being A.D.2017 the "Thirukkaarththikai Vilakkeedu" falls on the 3rd of December being the Fullmoon day in conjuction with the "Karththikai" Natchaththiram). It was essentially an ancient Religious Festival - of worship of "God Supreme" in the form of Fire, being one among the five element forms namely the earth, fire, water, air and space, which evolved among the Tamils (both Saivites & Vaishnavites) of ancient Tamil Nadu the Chera, Chola & Paandiya countries (the present Tamil Nadu & Kerala), long before the Tamil grammer Tholkaapiam was composed during the early second Thamil Sangam period around B.C.650. The five element forms are referred to in Tholkaapiam as follows. ".....Nilam Thee Neer Vali visumbodu iynththung kalantha mayakkam Ulagam aathalin....."
The worship of God in the form Fire is presently celebrated among the Tamils and Keralites of "Saivite and Vaishnavite - sects" throughout the world, as a day of Koyil Valipaadukal (Temple Worship), Illaththu Poosai Valipaadukal (Household Puja Worship) in all Saivite and Vaishnavite homes in the evening of the "Thirukkarththikai" day - with the Lighting of Lamps in the main Shrines decorated with Pookkal, Pooch Charangkal and Poo Maalaikal (Flowers, Flower Strands & Flower Garlands) and sweet smelling (Santhana Kutchikal) Incense Sticks lighted, followed by the (Sambirani) Thupa valipaadu, (Katpoora) Theepa valipaadu with the ringing of Kaimani (hand bell), the recitation of Religious Hyms with variety of flowers strewn to the Images of God invoking the blessings of the God Supreme, rejoicing with Thoranam decorations done both in 'Maavilai' and 'Thennam Kurutholai' (Mango leaves & young Coconut leaves), and the beautiful Kolam designs done on the floors either in white rice flour or in coloured dried coconut scrapings or coloured decorative powders, and Lighting of Lamps (Ahal Vilakkukal of Clay and other standing and hung Vilakkukal of Brass & Bronze) among them - representing the Fire form of "God Supreme" in the 'Flames' (bright light) of these Vilakkukal lit on this day in the Temples and Households, and serving of Fruits and Sweet Meals among the family members that were kept as Amuthu (Avi-Pali = Neiveththiyam) to the Images of God in the respective main Shrines during the Poosai Valipaadukal. This event, could be very correctly referred to as the "Ancient Tamil Festival of Lights" of Tamil Nadu. The Video on the following URL gives a glimpse of various types of Brass Vilakkukal available today in addition to the traditional "Mann(clay) Ahal Vilakkukal" used on this holy day of Kaarththikai Vilakkeedu in Tamil Nadu & Kerala. Kaarththikai Vilakkeedu falls on the special day when the “native star - Karththikai” in the “month of Karththikai” falls in conjunction with the full moon astrologically, which was considered "among the ancient Saivites of Tamil Nadu" as a very holy day for the worship of “God Siva”. In some years the Karththikai natchaththiram falls either on the day before or after the full moon day. 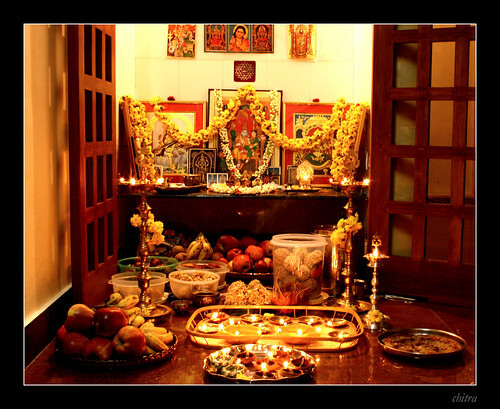 However all Karthikai natchatthiram days of the month of Karththikai of each year irrespective of it being or not in conjunction with the full moon on the same day, they were known as the Karththikai Vilakkeedu days, and the Karththikai natchatthiram day in the month of Karththikai of any year which falls on the day of the full moon was called as Maha Karththikai Vilakkeedu day. The term Vilakkeedu seperates as Vilakku + Idu and means Lamp Lighting, which brings forth the enlightenment from darkness to the surroundings and to the minds of those who light these lamps from the Sudar Oli (flame light) coming from them, to do their intense Prayers to “God - as Siva” on this holy day to invoke his blessings on themselves. 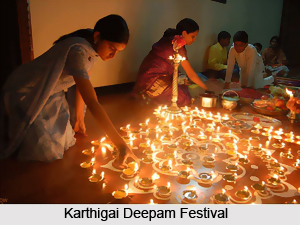 Kaarththikai Vilakkeedu in Tamil, is also populerly known as the Kaarththikai Theepam (also spelt as Deepam - Deepam is the Sanskrit word for Vilakku in Tamil). The Kaarththikai Vilakkeedu was also known as Thirukkaarththikai both in Tamil Nadu & Kerala and further as Thrikarthika in Kerala. “God Siva” (God as Siva) in the Saivaism that developed and practised in Tamil Nadu - known as “Tamil Saivaism” was of three aspects. The “formless” (Aruvam in Tamil), of “semi-form” (Aru-Uruvam in Tamil), and of “human forms” (Uruvam in Tamil). In the Aruvam form “God Siva” was represented as the “Infinite” - of no defined shape - known as “Ongkaaram” in Tamil and “Pranavam” in Sanskrit. “God Siva” in his “Ongkaaram” (Aruvam) form was represented as the five “elements” of the Universe - namely as Fire, Water, Air, Earth and Space - with which he created this world. The Kaarththikai Vilakkeedu Festival of the Saivaites of ancient Tamil Nadu, was essentially an intense 'worship' of "God Siva" in the element form of Fire, which was signified by their lighting of lamps in the evening on this auspicious day, and had no mythological legends attached to same at that time. The Saivam or Saivaism which developed in Tamil Nadu was called the "Thamil Saivam" (or Tamil Saivaism), as much as the Saivam that developed in Kashmir was known as "Kashmira Saivam" and that developed in Karnataka as "Vira Saivam". The Saivaism that originated from Nepal and spread all over India and Sri Lanka in the ancient times 'further developed in Tamil Nadu' - with the comingforth of the "new"- Siva Sakthi forms as indicated in the Agamic Texts of Tamil Nadu; with the composition of holy religious texts the eleven Tamil "Thirumuraihal" of the Tamil Saiva Naayamar (Saints), nurtured by the 'life histories' of the 63 - Tamil Saiva Saints of Tamil Nadu & Kerala in the Tamil "Periyapuranam", nourished by the Tamil "Meiyarivumudivu (Saiva Siththantham) Nookal" of 12 Tamil Santhana Kuravar, with the evolution of "Pancha Pootha Thalams" and "Atta Viratta Thalams - all being within the then Tamil Nadu, with the new modes of worship and religious practices - that took shape independently "influenced by and blended with" the "ancient culture and traditions of Tamil Nadu" that existed during those periods. am sudar nedungkodi pottpa thoantri, kayam thuhalkal aakiya payan thapu kaanam emmodu kalinthanar....."
“…..the forest with many flowers of Koangam that resembled, like the long root of a creeper of bright flames on (the day of) Kaarththikai natchaththiram (Arumeen) conjoining the full moon (Keli Iya) in the month (of Karththikai) when “aram” (religious & virtuous duties) were done….”. From the above four references it is clear that the Kaarththikai Vilakkeedu is an auspicious religious festival of early Tamil Nadu celebrated on the Kaarththikai natchaththiram day of the month of Kaarththikai whether it was cojoined or not with the full moon. In Tamil Saivaism the God Siva who was worshipped in the element form of Fire during the first Sangam Period of Tamil Nadu, and in the other four element forms namely Water, Earth, Air and Space in subsequent periods, were also represented in his “Symbolic” (Aru-Uruvam) form as the Panchalingams (five Lingams), with each Lingam representing an element form of the Ongaram form. However there cameforth a mythological legend about the origin of the Kaarththikai Vilakkeedu. Once God Thirumaal (Vishnu) and God Ayan (Pirammaa) had differences among them as to who was superior among them. At this instance God Siva appeared to them and with a view of sorting out their differences advised them - whoever who finds the extremities of his form would be deemed as the superior and turned into an infinite flame of Fire. God Ayan (Pirammaa) took the form of swan and flew sky high, while God Thirumaal (Vishnu) took the form of boar and dug the earth deep below to find the limits of God Siva in his form of an infinite flame. Both failed in their mission and God Siva appeared to them again, and both Ayan and Thirumaal worshipped him and accepted God Siva the - God Supreme. The Adi-Mudi thedal legend of was found for the first time in the Lingapuranam in Sanskrit from North India, that was re-composed with more legends added on God Siva around the beginning of the fifth century A.D. (A.D.401), during the period of Gupta kings of North India. ".....Thiru Nedumaal antru Ad-Mudi ariyum aatharavathanil kadumuran enamaki mun kalanththu earl thalam edanthu pin eithu ooli muthalvaa saya saya entru aluththiyum kaanaa malaradi enaikal....."
The other earliest reference to this legend is found in the paadal of “Atputhath Thiruvanthathi” of the female Tamil Saiva Saint Kaaraikkaal Ammaiyaar of early fourth century A.D. as follows. The next references to this legend is found in the Thirumurai Thiruppaadal of the Tamil Saiva Saint Thirugnanasampanthar and Tamil Saiva Saint Thirunaavukkarasar. "Ayanum Maalum kaanaa thee urvai nintraai poattri...."
This same legend is also found in Saint Thirumular’s Thirumanthiram (fifth century), in sage/poet Kallaadanaar’s Kallaadam, in Saint Cheramaan Perumaal's Thirukkailaaya Gnana Ulaa, and in Saint Karuvurthevar's Thiruvisaippaa - all being Saivite religious compositions in Tamil. This special form of Lingham was known as the “Lingothbavar”. The Lingothbavar form of God Siva is the normal Sivalingam but with the half or full height standing Siva carved within on the vertical face of the Lingam, with Swan shown on the side above him and the Boar shown on the other side below him. The Lingothbavar form of Siva is seen in many Siva temples on the outside of the Karuvarai of the temple right behind the Moola Moorthi within the Karuvarai. The name Lingothbavar for this form of Siva came into use from the Nayakkar period of Tamil Nadu. During the period prior to same especially during the Chola period this form was known as Lingapuraanathevar. Though this legend was known in Tamil Nadu before the composition of Lingapuraanam, with the coming of Pallava dynasty from the north of Tamil Nadu this legend - as found in the Sanskrit "Lingapuraanam" - had more impact on the Saivaism of Tamil Nadu that began to further develop under Pallavas but with heavy Sanskritisation. This impact could be seen in the Tamil Saiva Saint Thirunaavukkarasar’s Thevaarems which has many pathikams referring to this legend glorifying God Siva, and in his "Lingapuraana Kurunthohai" pathikam he specifically refers to God Siva in the infinite form (Ongaarm - Aruvam form) as a column of fire and later turned into the Lingam form (Aru-uruvam form) and blessed the Maal and Ayan. This impact could also be seen during the Chola Period when one of the Queens of Rajaraja Chola - 1 named Abimaanavalli has gifted the Rajarajaeswarem Temple of Thanjavur with a bronze image of Lingapuraanathevar. The worship of "God Siva" in the form of five elements were further associated with five important Siva Temples Shrines of Tamil Nadu and were known as “Panchabootha Thalams” (Bootham = element). These Temple Shrines were namely the Thiruvannaamalai (Fire), Thiruvaanaikkaa (Water), Thirukkaalaththi (Air), Kanchipuram (Earth) and Chithamparam (Space). The form of God Siva as a column of Fire at Thiruvannaamalai was referred to as one of his Ongaram (in Tamil) or Pranava (in Sanskrit) - forms. In the “Ongkaaram” forms God Siva was worshiped with the repetitive utterance of the holy syllable “Om” sung in piety, referred to as the ‘Ongkaara Manthiram’ or “Muthal Eluththu” in Tamil Saivaism. “Om” in Tamil is represented by the Tamil - alphabet “Oo with the Tamil alphabet “m” encompassed within. However in Tamil Nadu the holy syllable “Om” was also common to Vaishnavaism and Vedism, as the “God Supreme” of all these religions were ‘none but one’. The legend of ‘Adi-Mudi thedal’ being associated with the Thiruvanaamalai temple which in Tamil Nadu is confirmed by the four foremost Tamil Saiva Naayamaar (Saints) of Tamil Nadu namely the Thirugnanasampanthar, Thirunaavukkarasar, Suntharamoorthy and Maanikkavaasakar. It was at this Thiruvannaamalai temple the Tamil Saiva Saint Maanikkavaasakar composed the famous "Thiruvempaavai Pathikam" sung in piety in all the Siva temples worldover during the period of the Tamil month Maarkali. In this Pathikam (a collection of ten verses) too the Adi-Mudi thedal legend finds reference. "......Maal ariyaa Naamuhanum kaanaa malaiyinai......"
Further Tamil Saiva Saints Thirugnanasampanthar and Thirunaavukkarasar too have sung Tamil Thevaarap Pathikamgal on God Siva at Thuruvannaamalai. They could be viewed at the follwing URLs. The Ongaram or Pranava form of of God Siva and his form as Arunachaleswara at Thiruvannaamalai are glorified in the two Videos having the following URLs by the two great 'Tamil Classical Music' exponents of the present day Tamil Nadu namely Thirumathi Nithyasiri Mahadevan and Thiru S.B.Balasubramaniyam and "Arunachala Suprapatham by Bombay Sarada"
Important Note: - The Adi-Mudi Thedal legend has no connection whatsoever with the "Sivaraththiri Festival" but only with the "Kaarththikai Vilakkeedu Festival", and the "Kaarththikai Festival" too is not an extension of the Deepavali Festival. as wrongly portrayed by some Religious Scholars. Further the "special" worship of "Lingoathbava" form of Siva which emanated from the Adi-Mudi Thedal legend - is 'purly' associated with the Kaarththikai Vilakkeedu festival. 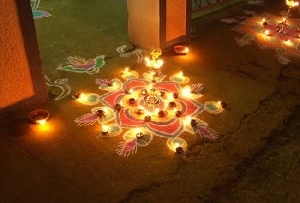 The "Kaarththikai Vilakkeedu" was essentially an Ancient "Tamilian Festival of Lights" of Tamil Nadu"
We have references to Kaarththikai Vilakkeedu in late Sangam period & post Sangam Tamil Literary works. But towards the end of post Sangam period we note the Kalappirar (Kalabra) dynasty from Karnataka invaded and ruled over Tamil Nadu, and spread their Aruka Samayam (Jain religion) in this region during the period. Hence we lack Tamil Literary works belonging to the Kalappirar period of Tamil Nadu between A.D 350 to A.D.550 (approx’) referring to the Kaarththikai Vilakkeedu. Then from A.D 550 we note the rise of a new dynasty the Pallavas invading the northern & central regions of Tamil Nadu from the Karnataka and brought them under their rule, while Pandiyans regained the sway over their heraditary southern regions of Tamil Nadu during this same period. The picturesque description seen above on the celebration of the Kaarththikai Vilakkeedu Festival by young girls and women at Mayilaapur, could have been somewhat similer to that have been shown in the Video at the following URL. During the period of the Pallava king Nanthivarman - 2 in the year A.D.808 Keeraippiriyan of Maamallapuram remitted to the Village Sabai(council) of Aamur Koattam 10 kalanju gold, the interest from which was to be utilised to conduct the Kaarththikai Naal (festival) in the month of Kaarththikai which was confirmed by the Sabai.